VIN SCULLY: WHY PHILLIES’ SANDBERG COULDN’T TAKE IT ANYMORE! 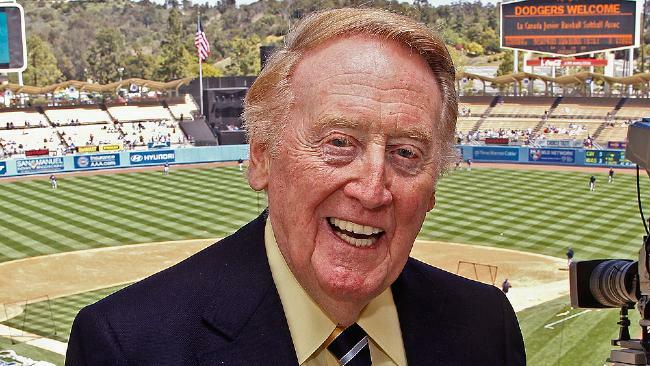 Vin Scully is not only the greatest announcer in baseball history — he’s been doing Dodgers games since 1950, in Brooklyn and L. A. — but he is also the game’s great philosopher. You wonder why a team is last, and then you watch them play. And it’s not the great, big egregious things, but the little things that happen throughout the game. Cesar Hernandez will be thinking about [that booted double play ball that extended the inning] all night, not to mention what it does to Pete Mackanin. You know when you watch Philly, and it’s not really a knock — I mean these are young players and they’re gonna make a lot of mistakes — but you realize that Ryne Sandberg, who had such incredible talent, a Hall of Famer, it had to be so difficult for him to sit there watching these kids kick the ball around, thinking, why can’t they do what was so easy for me? It’s hard for a really great player to understand that. But Galvis and Hernandez are learning. But finally Sandberg said I can’t take this anymore, and he resigned. Previous TICKER-TAPE PARADE FOR CARLI AND WORLD CUP CHAMPS? OF COURSE!